"Cyber threats pose one of the gravest national security dangers the United States faces" - Barack Obama. Sponsored by the National Cyber Security Division of the Department of Homeland Security and the National Cyber Security Alliance, October has been designated National Cyber Security Awareness Month (NCSAM). Since its inception in 2004, National Cyber Security Awareness Month been helping keep computer users safe online by promoting best practices in cybersecurity. The goal is to educate organizations in both the private and public sectors, as well as the general public, about cyber threats, while giving them the tools to combat a cyber attack. The hope is to increase resiliency in the event of a cyber incident. The only way to truly combat cybersecurity threats is through education. Cybersecurity is Our Shared Responsibility, and we cannot be secured without the help of everyone. Use the National Cyber Security Awareness Month 2015 hashtag #CyberAware in your social media messages. Join the weekly National Cyber Security Awareness Month Twitter Chat series on Thursdays in October at 3pm EST using #ChatSTC. 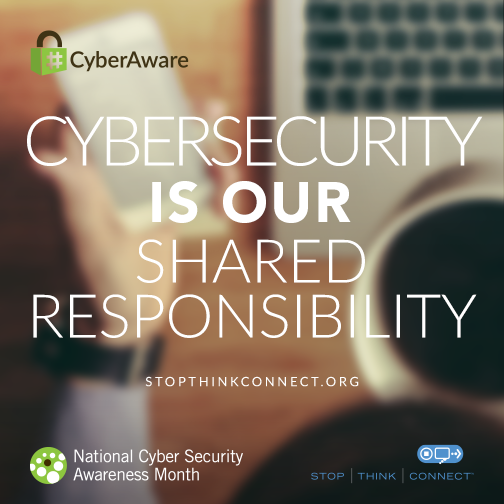 See what National Cyber Security Awareness Month activities are taking place in your area. Find information on how your government, law enforcement, business, school, or organization can take action. Post cybersecurity tips, news, and resources highlighting National Cyber Security Awareness Month on social media sites. Visit www.staysafeonline.org for resources, events, and other details.